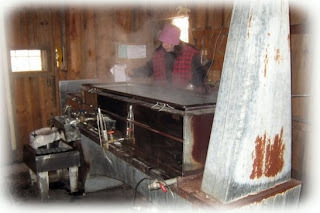 We didn't have a camera, but we DID manage to get out to the sugarbush - aka Kortright maple syrup festival! - before the maple syrup season ended this year. The only problem was, we got there before it started! With an expected high of -1 yesterday, there was no chance the sap would be running. Many trees had trickles of frozen sap running down them, but no signs of the "cold nights, warm days" that they need to get the sweet stuff flowing again. BUT the fun part is we all went! How, you ask? Well, we borrowed the parents' car. I drove the littles and one big (EC going, YM coming back) and Ted drove whoever was left. Everybody behaved reasonably nicely. YM started out kind of snitty but later cheered up a lot - maybe because he got a taste of maple syrup. 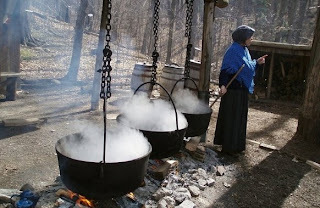 One of the ladies stirring the pots at the old-fashioned mapling station (at left) mentioned something I never knew... when the pots threaten to boil over, which would a) lose precious sap and b) jeopardize the fire, they would let fat drip into the pot to create a thin layer, like people do with pasta so it won't boil over. A naive park visitor asked what type of fat they would use but I already knew... BACON. They'd attach a chunk of it to the chains and the heat of the steam would melt off just enough that it would drip in the pot. The bonus, the lady said, was a nice smoky taste to the syrup. Ummm... okay. So then Elisheva asked if we could still have our customary taste of the finished syrup. Well, I said yes. I mean, they don't really, really use bacon in this day and age, with so many Muslim, Jewish and vegetarian visitors, right??? In the rare event that they had, maybe it would be bottul b'shishim? Anyway, yikes! It was a real pleasure going out with everybody. The baby refused to be content in the ergo on my back, so Ted carried him in his big yellow jacket (sorry, no picture! ), but then it was okay because the way back up the valley was very steep and I ended up carrying Naomi Rivka up in the ergo. We did the usual wagon ride while sneering at the depressed-looking ponies trotting around in a circle for the folks who felt like paying $3 a "ride". Which reminds me... in Sears tonight, I saw a little girl holding a piece of "Dora" merchandise - just some kind of cruddy doll or something, a plasticky thing in a package. But the expression on her face, well, sheer rapture. Anyway, Ted said he'd speak to his sister. How to say it nicely, though, because I love the fact that they feel connected to the kids here? But I do not want them - with their clothing, toys and play scenarios - to be walking, talking billboards and commercials for products I feel are little short of EEEEeeeeevil. I said to maybe suggest fewer things - and not just videos, either - but maybe things that are harder for us to come by - like wooden trains, which are very expensive. A few new train things would probably rekindle Naomi's interest for quite a while, and it won't be long before Gavriel Zev is interested, too. Aargh. She was all over him today. I know I'm doing this out of sequence because THIS post is about yesterday and the NEXT one is about today, but bear with me. She was everywhere - climbing over him, nibbling his fingers, "boodoo-badda-ing on him" (which involves rubbing his hair, actually kind of gently). I tried to channel it constructively - I got out the doctor set and said we could check if he was healthy... then I redirected her into checking the health of Dorothy and Tracey, her two main dolls-of-the-moment. Dorothy is named after Dorothy in the Wizard of Oz. Tracey is named after our dance teacher in Creative Movement with Parent last session. It's kind of cute because the real Tracey is black and the doll Tracey is very pale pink. But the real Tracey isn't made of rubber either, and she has hair, which the doll Tracey doesn't, so I guess Naomi doesn't see or care about one more incongruity. I'm looking forward to the next session of the dance classes. They cut into naptime a bit, which will be hard, but may give me a chance to spend "alone time" with Gavriel Zev either upstairs in the library or at the plaza, okay, getting coffee! It's only half an hour, but it's hard to believe Naomi's ready for classes all by herself. Her swim class is also by herself but there is no library or plaza nearby, so I'll have to stay, sit on the bench, watching and waving. All that excitement starts next week. Sunday - Mommy-made PANCAKES (weird) and tinned soup and salad. Very simple supper, which is what we all needed after a few days of Purim, Shabbos, etc.